The Pemaquid Lighthouse on the rocky coastline of Downeast Maine. I can’t believe summer almost flew by without a trip to the rocky coastline of Downeast Maine! I am missing the beautiful landscape I wasn’t able to enjoy this summer due to a complex project for a client so I am thrilled to be heading there today. In preparation for my reentering the state’s abundant natural beauty, I’d like to share a riff about one of last year’s trips that celebrates an expressive writer and soulful environmental activist. 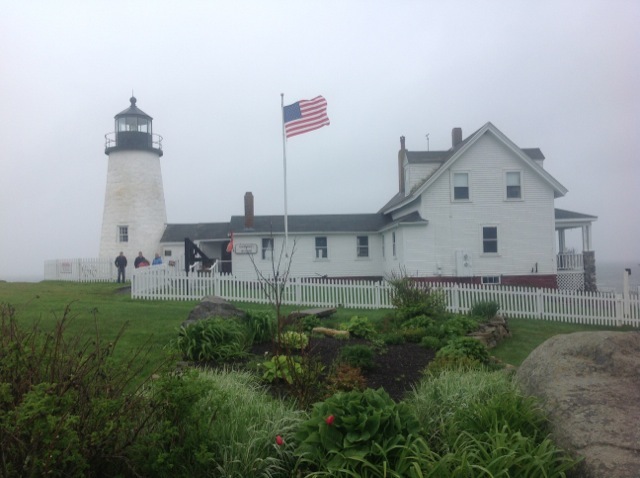 The friend I am visiting, Zina Glazebrook, has moved up the coast a bit and is now near the Pemaquid lighthouse featured in the lead image in this post. We took a trip to the spot along the shore where the waves blast onto land last year when she and her darling dachshund Iggy were living in Boothbay Harbor, which is where this musing takes place one deliciously drizzly afternoon. I knew it would be a perfect day for cozying up to the fire so I made quick work of moving a wing chair to a spot where I could enjoy both the warmth flowing from the fireplace and the view. I propped my feet up and gazed at the boulder-strewn shoreline, my writer’s notebook in my lap, thinking about how many times I have made this exact move—from Tuscany to Lake Como and Paris to London. There’s something about sitting and staring out a window to take in one’s surroundings that serves as an important act of settling in. It is also an integral a part of the creative process for me as a writer that I call making friends with a place. That day, as the harbor fingered landward, I made note of how it narrowed to end in a crescent pocked with rotund stones cresting the silvery liquid even at high tide. At low tide, a squidgy-looking silted floor revealed itself, the muck pocked with clumps of mossy green seaweed. Sans water, the grasses were relieved of their ability to undulate poetically, slumping to form globs of sludge that melded with the gunky floor. At first I thought to describe the bottom as moon-like, a world where craters fill with water, but it was friendlier than that. 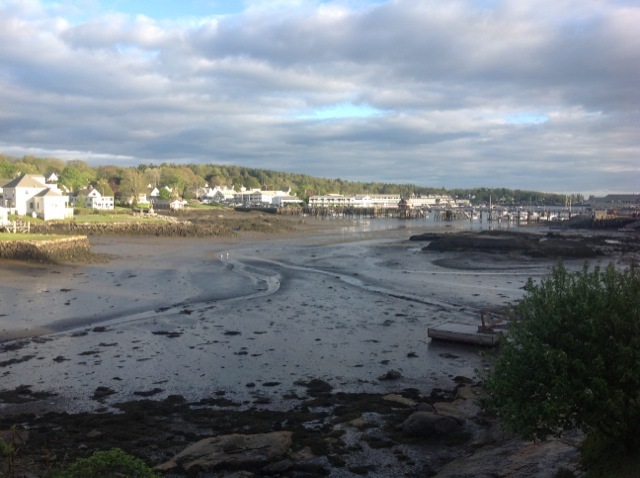 Boothbay Harbor with an ebbing tide. As in most coastal communities, there was the normal jumble of human-activity gear marring the natural beauty, perhaps the worst offender an above-ground hot tub set within an outcropping of land off the parking lot of a nearby hotel. The whirlpool’s ugly exterior was the counter opposite to the aged stone that surrounded its platform—the walls, which disappeared into the harbor when the tide sluiced in, pocked with patches of mustard-yellow organisms of such a bright hue I couldn’t believe they were natural. As I stared at a circle of plastic Adirondack-style chairs and occasional tables in the most garish colors imaginable, I wondered, Why is it some humans choose to buy such ugliness rather than opting for furnishings that manifest natural beauty and are inherently sustainable due to their classic features and well-made longevity? Set against the lush tones of lawns effervescing from a solid week of rain and the beautifully hued lichens, these machine-made artificial atrocities were downright offensive. What I love about this narrative is how it illustrates what a lyrical writer she was. It’s not the first notion most people call to mind about her due to the fact that her book Silent Spring set the environmental movement in motion, but it’s how I remember her. 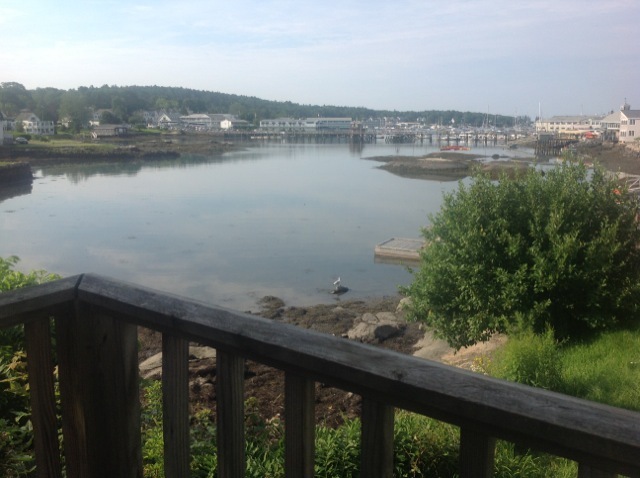 Boothbay Harbor with a flowing tide. As I watched a sudden swell in the water toy with a dock holding shiny yellow, orange and red kayaks, I had to wonder what she would think about the environment’s further decline and the added threat that plastics bring to the dilemma were she still alive. This pier sliced into the scene, culminating in a floating segment that moved at the bidding of the rising and lowering tides. As I watched its edge wobble, raindrops began stippling the water with their nimble points, circles of movement radiating out to interrupt the reflection of the cloud-choked skies the sun was trying its best to penetrate. The gulls keened as they pirouetted in the air and dropped swiftly to skim the surface of the shallowest waters. A large crow lit on the crossbar of the structure separating the anchored section of the dock from the fluctuating platform and began cawing from the frame as if he sought entrance through this veritable doorway at the land’s edge. On that Independence Day, I found that what nature was saying was more interesting that what people had to say; I found that the elemental effects deposited in the beautiful setting seemed so much more relevant than the things people decided were necessary to outfit their frantic vacation days filled with sport and relaxation. As I closed my writer’s notebook to move my chair closer to the fire, I wondered, Is this really the legacy we want to leave? Carson had some powerful advice for parents who want to ensure their children learn how to truly care for the environment. Studying those ghastly chairs, I began to wonder what initiatives the design industry has in place to marginalize impacts on the environment. I will be doing some investigating in the months to come. If you know of any sustainable efforts, or corporate social responsibility or corporate social vision strategies being implemented, please leave me a comment so I can include them in future writing, okay? 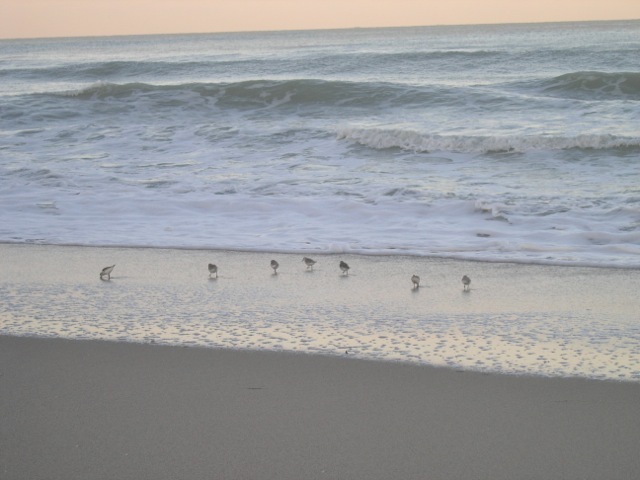 “While the tide was still ebbing, the sanderlings fed on the island beach…” Rachel Carson.